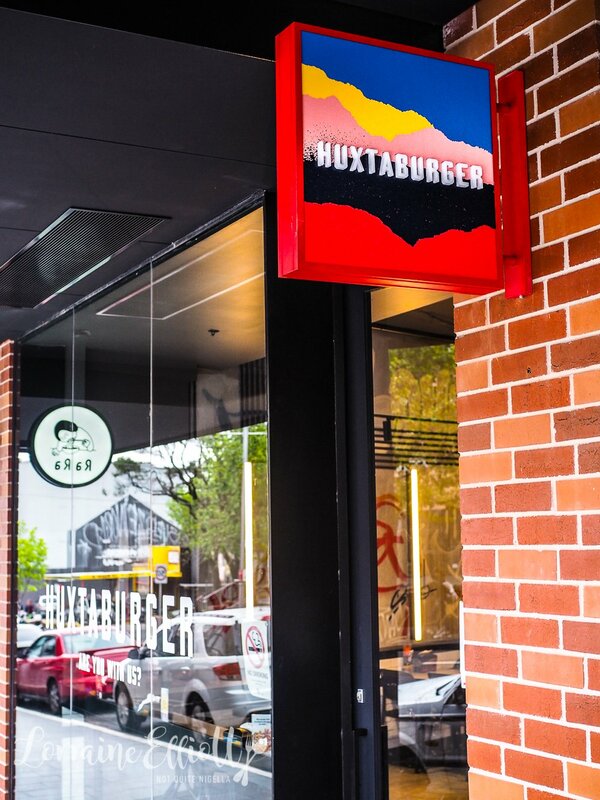 Huxtaburger, the Melbourne based chain of burgers makes its way to Sydney. So what will you find? 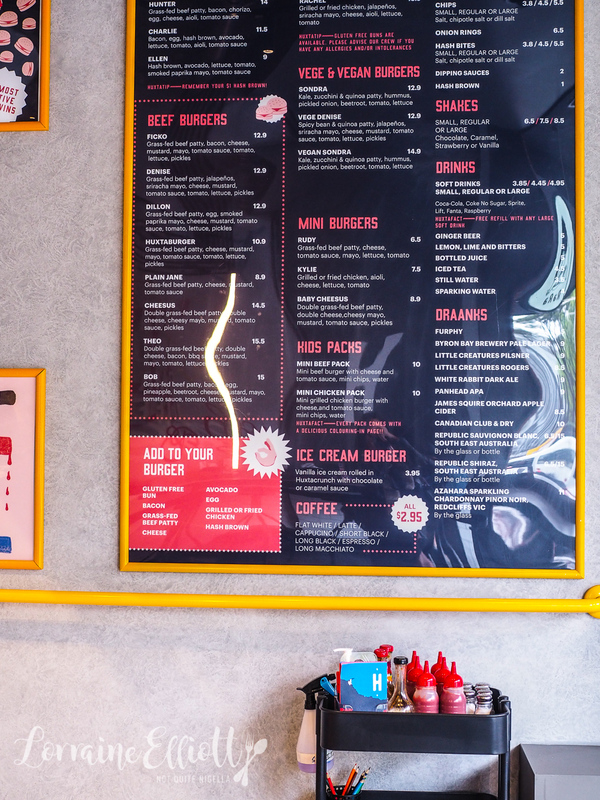 There are a wide range of burgers, shakes and dessert burgers all with names based on the Huxtable family members (with one notable exception!). 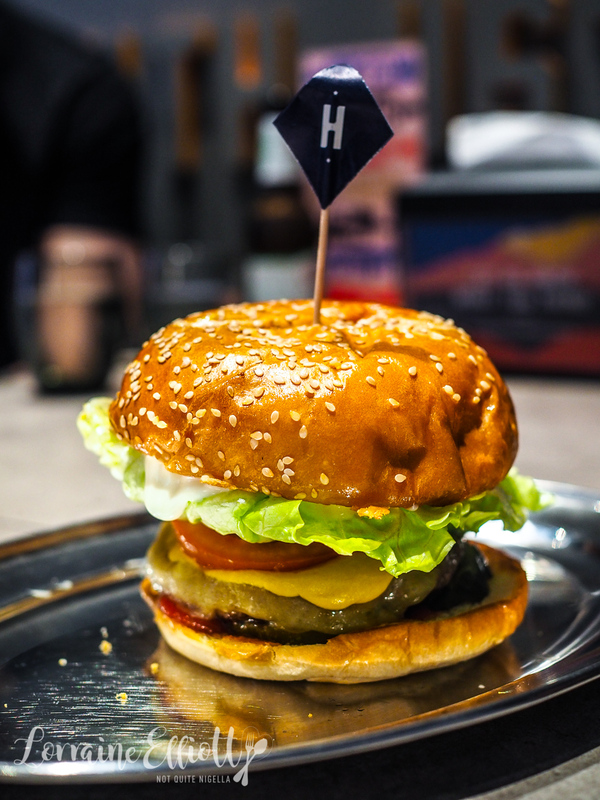 Huxtaburger is located on Regent Street near a new hub of eateries and a bakery and when we arrive we can see that it is already popular. There's a long line of people waiting to order and I join the queue of people looking at the menu. Service is friendly and when there's a lull I ask the counter guy what is good. He tells me straight away the best, most popular and most different burgers. 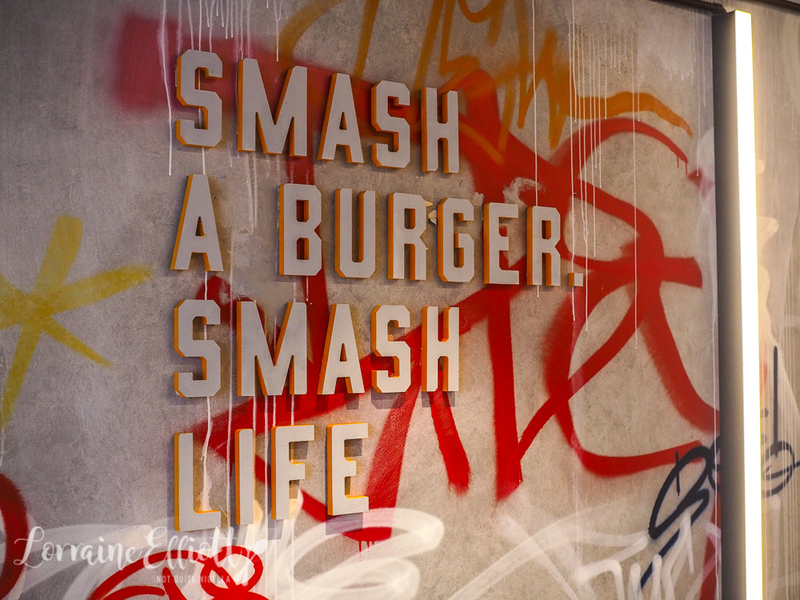 And when Ivy and Ryan walk in a few minutes later we know exactly what to order from the menu that sports inspirational sayings like "Play hard, live an aspirational life. Chase awesomeness. Do things that make you say "#$@% Yeah!" or "We own taste." The food comes out very quickly. 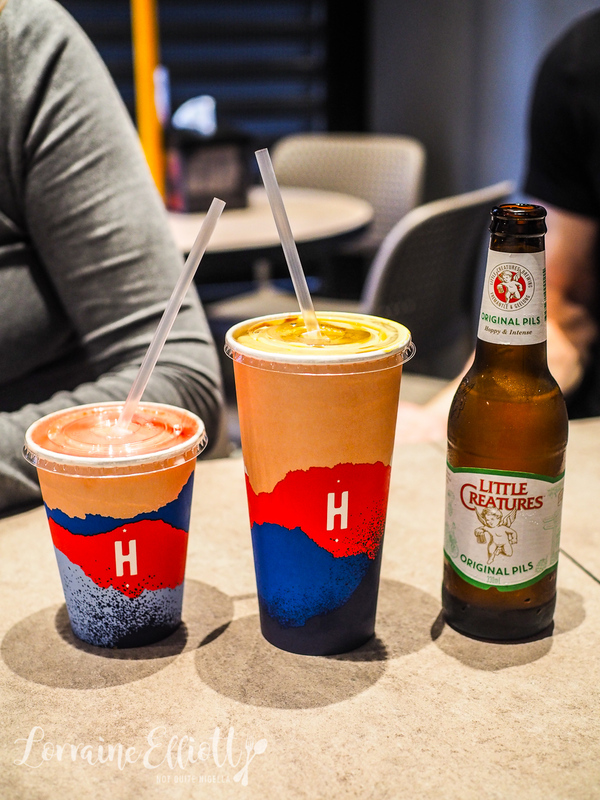 First to arrive are the shakes-it's a strawberry shake for Ivy and a caramel shake for Mr NQN while Ryan has a beer and I stick with water. Everyone loves Ivy's shake that tastes of fresh strawberries and isn't overly sweet. Mr NQN's caramel shake is also really good, with a nice burnt caramel. I start with the most basic of the four burgers, the classic Huxtaburger. It's a grass-fed beef patty, cheese, mustard, mayo, tomato sauce, tomato, lettuce and pickles. There is a really good balance of the richer ingredients like the beef and cheese with the crisp freshness of lettuce, tomato and pickles. All four burgers that we ordered are distinct from each other and Denise (Ivy's pick) is a nicely spicy burger with a grass-fed beef patty, jalapeños, Sriracha mayo, cheese, mustard, tomato sauce, tomato, lettuce and pickles. We all love the spiciness to this burger which is the predominant feature. I wasn't sure how Americans Ivy and Ryan would like the Australian version of a burger with pineapple, egg and beetroot. 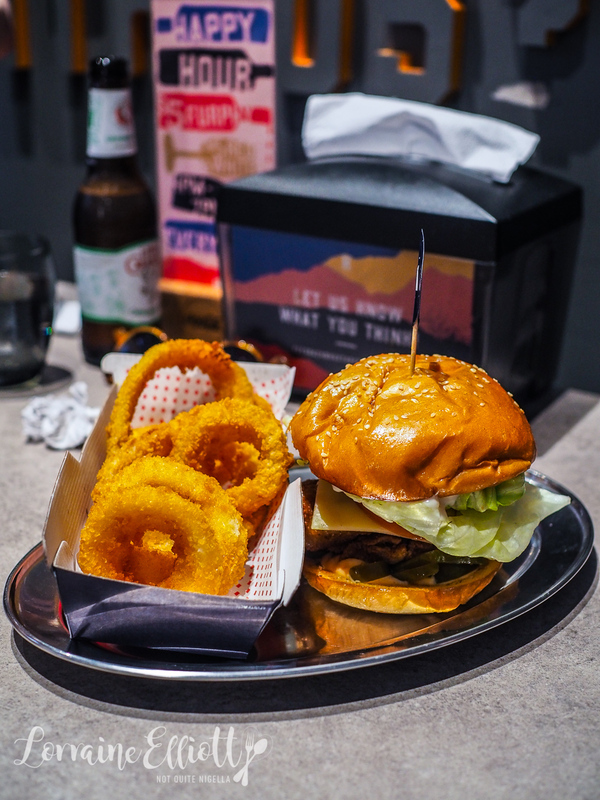 It's the largest burger that we've ordered (although not the largest on the menu, that honour belongs to the Cheesus burger). 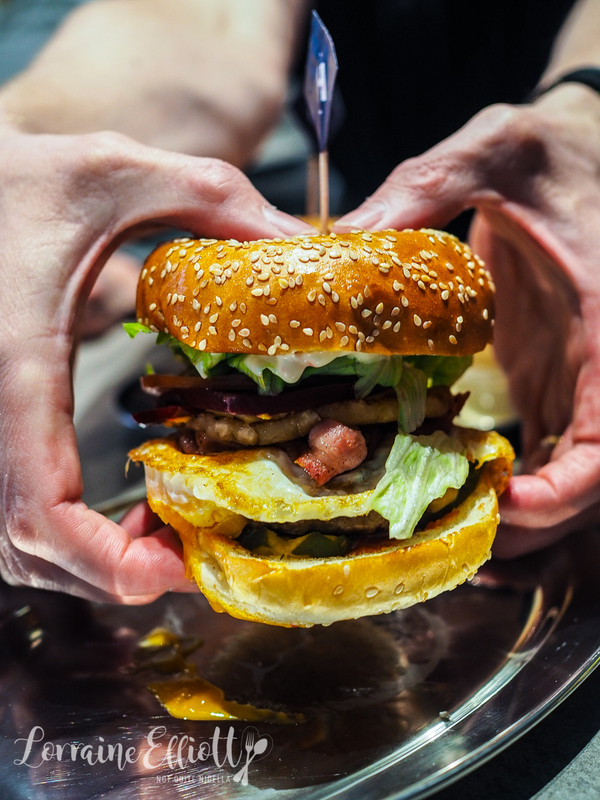 The Bob is a grass-fed beef patty, bacon, fried egg, pineapple, beetroot, cheese, mustard, mayo, tomato sauce, tomato, lettuce and pickles. It's enormous and it can be hard to get a bit of everything in one bite but it's a great burger although I seem to be the only one that gets any pineapple. The Rachel (I guess by now they're going for American sit-com names) consists of either a grilled or fried chicken fillet (fried of course!) with jalapeños, sriracha mayo, cheese, aioli, lettuce and tomato. The chicken fillet is large, juicy and moist with a surprising spiced aspect to it. It's a good burger but I think all of us preferred the beef burgers. The onion rings come out with the burgers. And we all sort of wish we had ordered two serves of these as they're onion ring perfection. We also order two sauces: a cheese mayo which I chose out of curiosity as well as a Sriracha mayo because hello chilli sauce! The cheese mayo isn't overly cheesy, I think I was hoping for a cheddar flavour while the Sriracha mayo is perfect for dipping. There's also ketchup available as well as a strange sort of hot sauce that tastes like Italian pasta sauce which doesn't really suit anything on the menu. 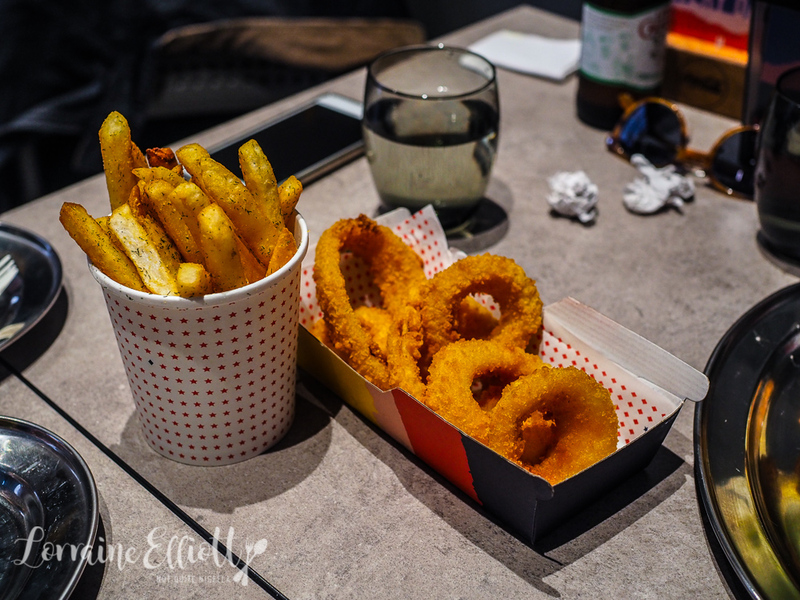 We also try the fries which are good but if choosing between the fries or onion rings, onion rings always win. 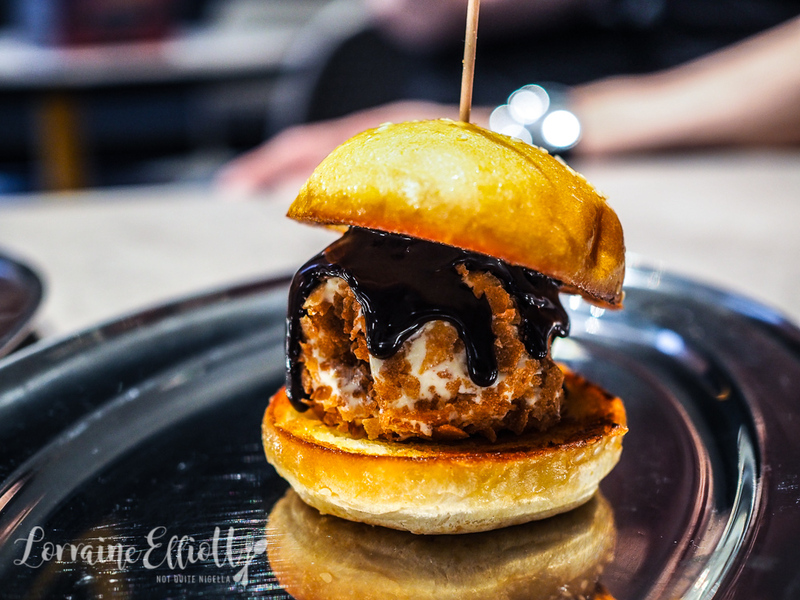 There's one dessert on the menu: an ice cream burger in a slider size and it comes in two flavours: chocolate or caramel. 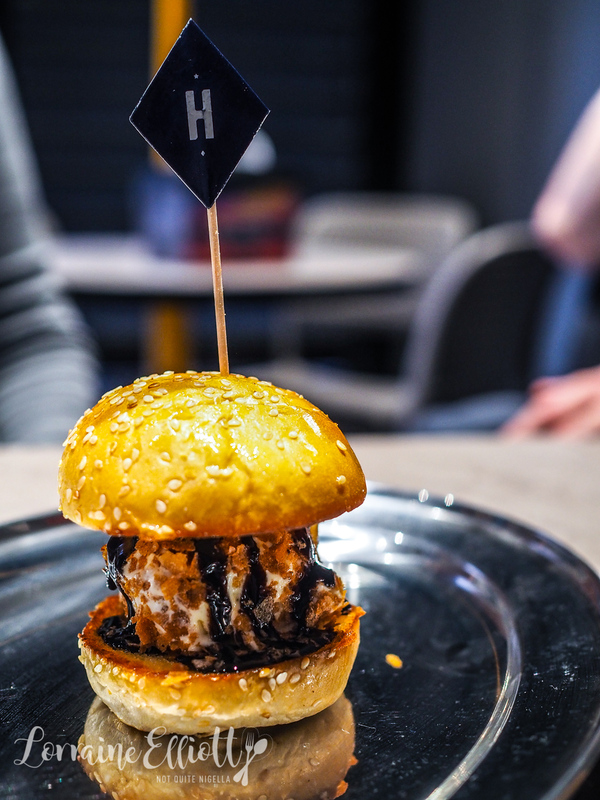 They're small sesame seed topped buns filled with vanilla ice cream rolled in Huxtacrunch (biscuit-ty flakes that remind us of honey cornflakes and we all prefer the caramel sauce to the chocolate sauce out of the two. 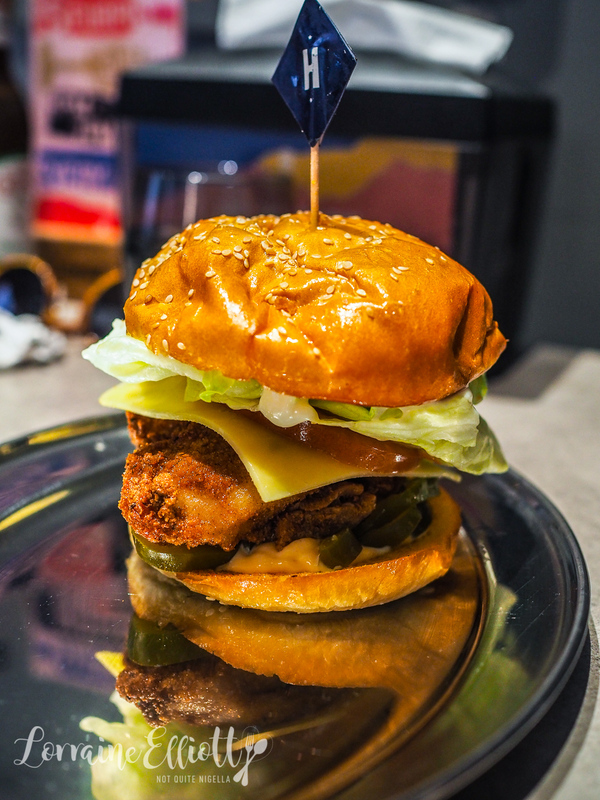 So tell me Dear Reader, would you go for a grilled or fried chicken fillet in your burger? And do you like burgers with beetroot and pineapple in them? Do you like salad in your burger? 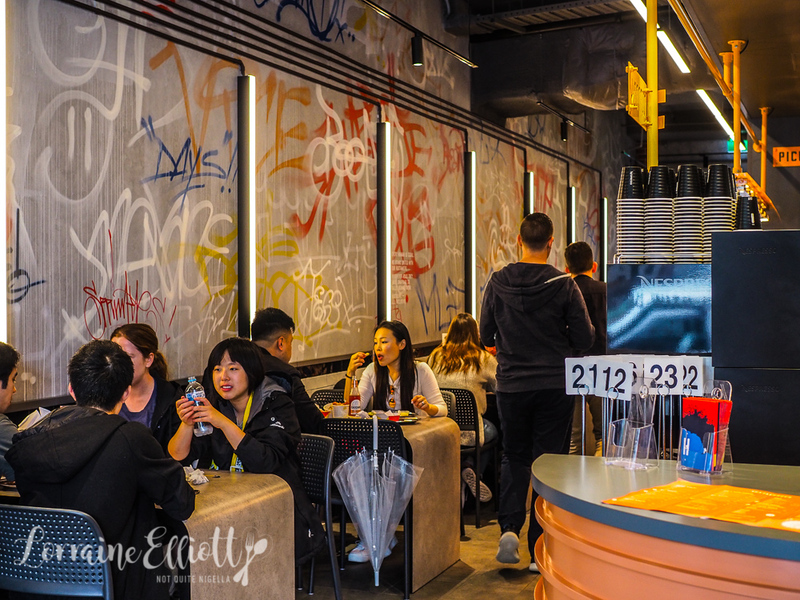 restaurantThe Fast, Flaming and Furious at Wings X Tins, Darlinghurst!